Ukrainian Academy of Arts and Sciences. The official English name of the Ukrainian Free Academy of Sciences (Українська вільна академія наук; Ukrainska vilna akademiia nauk, or УВАН; UVAN). UVAN is an academy of Ukrainian émigré scholars, founded in November 1945 in Augsburg, Germany. At its founding meeting UVAN was defined as the Ukrainian academy-in-exile, inheriting the traditions of the All-Ukrainian Academy of Sciences (VUAN), whose important work began in the 1920s and was quashed by the Stalinist terror. The first president of UVAN was the historian Dmytro Doroshenko. Initially it was made up of 17 professional groups, representing 150 scholars and scientists. It organized joint conferences and annual conferences in Taras Shevchenko studies with the help of the Society of Friends of UVAN, directed by Vasyl Mudry. The first UVAN publications were an informational bulletin (1946–7), a chronicle (1947–8), a book on Kyiv's historical maps by Petro Kurinny and Oleksa Povstenko (1947), and a book on Hetman Danylo Apostol and his age by Borys Krupnytsky (1948). In April 1948 the first 24 UVAN full members were elected at a conference in Regensburg. After most postwar Ukrainian displaced persons and refugees emigrated from Germany to the New World in 1947–8, the UVAN center in Augsburg lost its importance. In 1949 the presidium was transferred to Winnipeg, where Dmytro Doroshenko had settled, and named in English the Ukrainian Free Academy of Sciences in Canada. Doroshenko was succeeded as president by Leonid Biletsky (1951–4), Jaroslav Rudnyckyj (1954–74), Alexander Baran (1974–7, 1980–3), Jaroslav Rozumnyj (1977–80), and Michael Marunchak (since 1983). In the 1980s UVAN acquired its current English name. It was divided into social sciences, humanities, and mathematics and natural sciences sections and had its own library, archives, and Ukrainian War Museum (Gen Mykhailo Sadovsky's collection, formerly of the Ukrainian Military History Institute) in Winnipeg. It has published booklet series, such as Slavistica (begun in Augsburg, 87 issues, 1948–86), Onomastica (50 issues, 1951–76), Literatura (11 issues, 1949–70), Litopys (29 issues by 1983), and Ukrainski vcheni (19 issues, 1949–80), on Ukrainian scholars; Rudnyckyj and D. Sokulsky's annual bibliography Ukrainica Canadiana (1953–72); Taras Shevchenko's Kobzar (4 vols, 1952–4), edited and annotated by Biletsky; Rudnyckyj's materials on Ukrainian-Canadian folklore and dialectology (9 fascicles, 1956–63) and Etymological Dictionary of the Ukrainian Language (2 vols in fascicles, 1962–75); Marunchak's The Ukrainian Canadians: A History (1970; rev edn 1982), studies on the history of Ukrainians in Canada (5 vols, 1964–80), book on Ukrainians in the USSR outside Ukraine (1974), and biographic dictionary of Ukrainian Canadians (1986); and several other publications and collections of articles. In 1989 UVAN in Canada had over 60 full members. 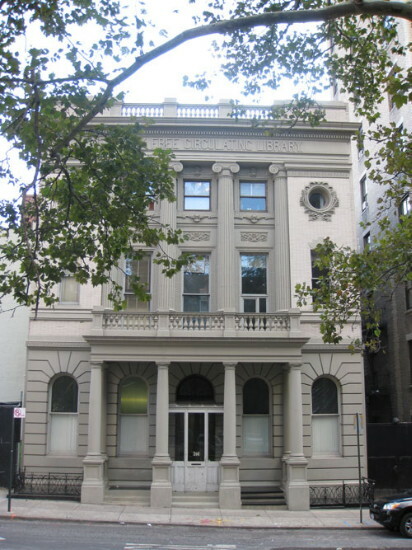 UVAN members who settled in the United States established their own organization (in English, the Ukrainian Academy of Arts and Sciences in the US) and foundation in New York City in 1950. UVAN groups were also organized in Detroit (1955), Denver (1955), Washington (1956), and Philadelphia (1970s). In 1961 UVAN purchased its own building in Manhattan. Its presidents have been Mykhailo Vetukhiv (1950–9), George Yurii Shevelov (1959–61, 1979–84), Oleksander Arkhimovych (1961–70), Oleksander Ohloblyn (1970–9), Yaroslav Bilinsky (1984–90), and M. Boretsky (1990–2), Marko Antonovych (1993–7), Oleksa Bilaniuk (1998–2006), and Albert Kipa (since 2007). The UVAN in the US has consisted of historical, ancient history, literary-philological, ethnographic, pedagogical, philosophical, bibliographic, economics-law, biological-medical, musicological, and physics-chemistry-mathematics-technology sections; a fine arts group; the Commission for the Preservation, Study, and Publication of the Heritage of Volodymyr Vynnychenko (chaired by Hryhory Kostiuk); the Shevchenko Institute; and the Archeological-Anthropological Institute. In 1986 it had 64 full members (many of them professors at American universities), 80 corresponding members, and 23 scholarly associates. Its library (over 50,000 vols) and museum-archive (the most valuable archive outside Ukraine) have been directed by Volodymyr Miiakovsky (who began them in Augsburg) and V. Omelchenko (since 1972). 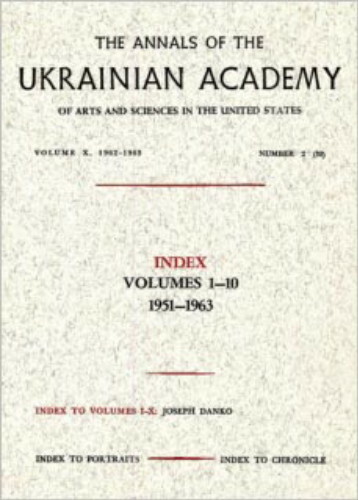 The UVAN in the US has issued over 90 publications, including 16 volumes of its English-language Annals of the Ukrainian Academy of Arts and Sciences in the United States (from 1951) and several other collections of articles; 10 issues of the annual Shevchenko (1952–64); Oleksa Povstenko's study The Cathedral of St. Sophia in Kiev (1954); editions of Valeriian Pidmohylny's Misto (The City, 1954) and Mykola Kulish's plays and letters (1955); Yevhen Chykalenko's memoirs (1955); Dmytro Chyzhevsky's history of Ukrainian literature (1956); editions of Symon Petliura's articles and letters and documents pertaining to him (2 vols, 1956, 1979); Volodmyr Vynnychenko's previously unpublished works (1960, 1971–2, 1988) and diary (2 vols, 1980, 1983); editions of literary studies by Mykola Plevako (1961) and Pavlo Fylypovych (1981); collections of Ukrainian folk melodies compiled by Zinovii Lysko (6 vols, 1964–71); books on the artists Myroslav Radysh (1966), Viktor Tsymbal (1972), and Petro Andrusiv (1980); Ihor Sonevytsky's book on Artem Vedel and his musical legacy (1966); a collection of articles on the Silskyi Hospodar society (1970); Olha Kosach-Kryvyniuk's chronology of the life and work of Lesia Ukrainka (1970); an edition of Oleksander Koshyts's religious musical works (1970); Vadym Pavlovsky's book on Vasyl H. Krychevsky (1974); S. Pohorily's book on Vynnychenko's unpublished novels (1981); and Dmytro Doroshenko's book on Hetman Petro Doroshenko (1985). The academy has also organized lectures, seminars, conferences, commemorative events, art exhibitions, concerts, recitals, and summer seminars (near Hunter, New York). The few UVAN members who remained in Germany after 1948 were concentrated in Munich. They were led by Petro Kurinny until 1972, after which the European UVAN ceased activity. Yurii Blokhyn was the Munich representative of the UVAN in the United States between 1976 and 2002. A referral to this page is found in 38 entries.